Once you step off the boat you’ll be greeted by colorful crafts, traditional dress, and the Mayan dialect. Some of the more prominent lakeside towns bear the clear imprint of Westernization, mainly visible in the form of lake-side businesses owned by foreigners — and you’ll see the difference immediately. Part of what keeps the Mayan culture protected from being completely swallowed and co-opted by tourism is certainly the remote nature of the villages, but another more interesting aspect is the adaptability of the indigenous villagers themselves. In order to keep their ways alive, they have turned their culture into the product that travelers come seeking. Roadside shops sell brightly colored textiles, traditional food, and crafts geared towards travelers. For many mindful travelers, this creates a sort of Catch-22. 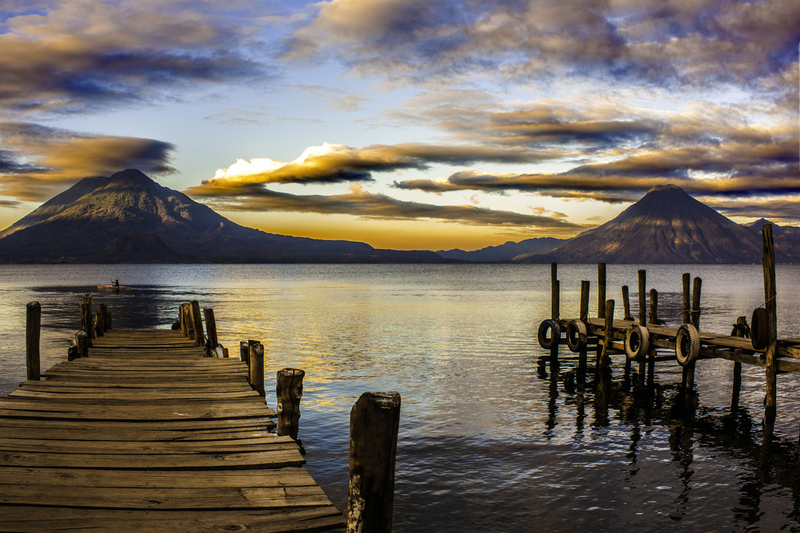 Though we feel honored to have the opportunity to visit villages like San Marcos, Santiago, and Santa Cruz along the stunning shoreline of this volcanic lake, the presence of such an ancient way of life demands that we bring our full consciousness to bear in our travel choices and interactions. Do we choose to support a local-run business when we shop or choose lodging? And how, exactly, do we know what’s authentic Mayan culture and what is romanticized for the tourists? The village of Santiago is said to be one of the true strongholds of Mayan culture on the lake. Home to eleven Cofridas, or ceremonial houses, and two ancestral sacred houses this village is the home of much Mayan ritual. These spaces are regarded as living, breathing sacred realms where the ceremonies of life and death occur every day. Led by Shamans from near and far and, for the community, these ceremonies are a vital part of existence. Santa Cruz, on the other hand, is known to be the home of Rilaj Mam, or the Wise Venerable one (also known to be a trickster) who came to protect the Mayans when the Spanish arrived. The average tourist wouldn’t know where to look, or what to look for – especially since the Spanish Conquistadors erected very Catholic-looking churches all along the shores of the lake in their efforts to convert the locals. But in their own unique and sometimes surprising ways, the Mayans have adopted and transformed these spaces and deities to hold their rich history. These often-covert spaces and practices show the craftiness and resilience of a culture that made the Spanish think they were converted but turned Christ into the “twin” saint of their own Rilaj Mam. So what’s a seeker to do? You won’t find most of this information in your average tourist handbook, so you’re likely to have better luck seeking guidance from a knowledgeable local organization, guide, or on-the-ground, in-the-moment adventure that allows you to follow your intuition. Open your eyes and ears to discover the places and people that pique your curiosity, then open your mind and listen with respect and gratitude for the window into a tradition likely far removed from your own. Maybe you want to explore a retreat center, or seek out the Panaderías (bakeries), supply stores, local markets (best for produce! ), and comedores (small eateries) that truly support the local economy. Sit down with your breakfast, leave your book or phone aside, and see what sorts of interactions appear. A glance, a chance meeting, a shared moment… Open yourself to the magic of Lake Atitlán’s rich Mayan culture, and you never know what your travels will uncover.